Wouldn’t it be great if you could turn your web site in to a lead generation funnel? Instead of just getting visitors, you can actually find people that want to know more about your offer. Having a web site is absolutely critical for your business success. Just putting up a web site and hoping it creates sales is going to be a disappointment. Instead use your web site as a lead generation funnel and actually drive sales. When your web site becomes a lead generation funnel, visitors can reach out to you to learn more about your offer. They do this by filling out your capture form. This capture form can be as simple as asking for an email address. You can also qualify your leads better by capturing demographic information or asking them for specifics on what they are looking for. Once they fill out the form and confirm their request, they are added to your database for follow up. This is where your autoresponder comes in. We suggest having a series of pre-written letters set up that can be automatically sent out to everyone that fills out your form. These letters will introduce you to your prospects. These letters can let your prospects know how you can help them solve their problem. These letters help you build that “know, like, and trust” factor so that they are more open to doing business with you. 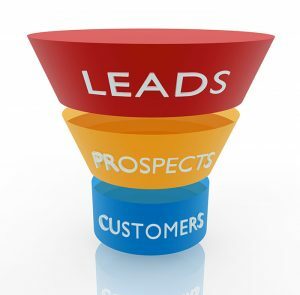 It all starts with the lead generation funnel. The first part of that funnel is the capture form added to your web site. The form offers more information, a free sample, a free report, etc… We call this a “lead magnet“. Once they have filled out your form, you now have a lead. Your autoresponder sends out your follow up messages on a schedule you determine. The letters help your prospects get to know you. As they get to know you, they may even start to feel like they trust you. When the time comes for them to make a purchasing decision, they are more likely to buy from someone they know, like, and trust. This process converts web site visitors to actual leads. Follow up takes them from being leads to real prospects. And then … on to making them a customer. And that is what your business needs: Customers. If you would like to learn more about how you can turn your web site in to a lead generation funnel, just fill out the form below to receive our free report.